Directions- Cut center of coffee lid out. You want to just end up with the rim. (See photo) Trace around lid on to felt but when you cut the circle, add about 1/4" to make it larger.It needs to be larger so coffee lid will fit inside and you will have room to sew around it.Pin this circle to felt and cut 2 more. You should have 3 circles of felt now. 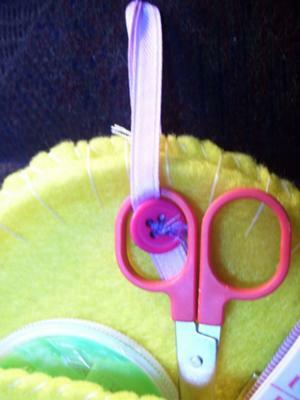 Cut a 5" piece of ribbon for the loop on top that will hold the scissors. Lay one half of snap one end of ribbon and sew on. 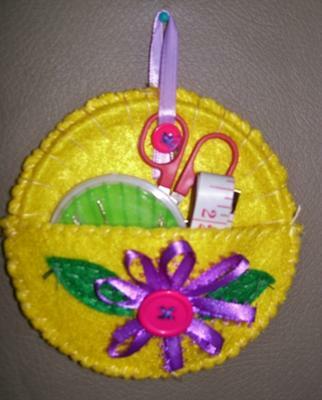 Lay button on top of snap on the backside and sew on.Now take other end of this ribbon and sew to top of one felt circle with snap facing you. Grab another circle and lay on top of the one you sewn the ribbon to. Bring the button with the half snap over and mark where the other half of snap will go by just sticking a pin there. Sew this half on. Lay coffee lid inside both these circles and pin edges closed. The ribbon is the top of the caddy. Start sewing circles together at bottom. A simple whip stitch looks nice. Just take your time and make your stitches even in size and spacing. Go completely around. Now repeat around circle by making stitches go "inside" the plastic ring, as close to it as you can. To make the pocket, take last circle and cut in half. Take one half and sew your decorations on. On this one I made a ribbon flower. To make, pick a button you like for the center. Cut a small circle from felt that will fit behind the button and not show from the front. 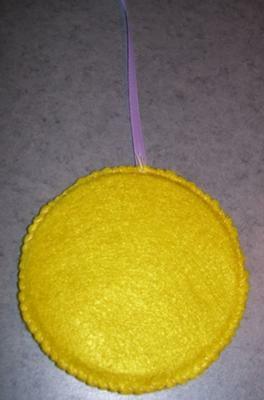 Take a length of ribbon and sew one end to this little felt circle. Bring ribbon over to make a loop and make a stitch to secure. Go around the circle, making loops for petals. Sew button on top for center of flower and then sew to the center of the pocket piece. Cut out 2 leaves from green felt and sew these on also. Place both halves together and pin. Sew around all edges with whip stitch. Place on caddy and sew pocket on. Try to go over the same stitches already sewn. Place scissors over the front snap. Bring end of ribbon with button and snap to secure. (See photo) Fill caddy with sewing supplies. If using as coupon holder, cut a few coupons from newspaper and add to pocket for the person you are giving it to. If using it as a note pad holder, include a new pencil and little note pad in pocket.